That's me! I run a newspaper, but my true passion is writing tales of adventure. Here on Mouse Island, my books are all best-sellers! What's that? You've never read one? Well, my books are full of fun. They are whisker-licking good stories, and that's a promise! Holey Cheese! Imported from Italy, this snazzy series debut about a globetrotting mouse journalist spreads the cheesy puns nice and thick. On an average day, Geronimo Stilton edits The Rodent's Gazette, the newspaper of New Mouse City, capital of Mouse Island. But at the coaxing of his sister, Thea, and various relatives, Stilton sates his yen for adventure-and adventure writing-by embarking on various excursions and recording and illustrating his exploits in a diary that serves as source material for his books. 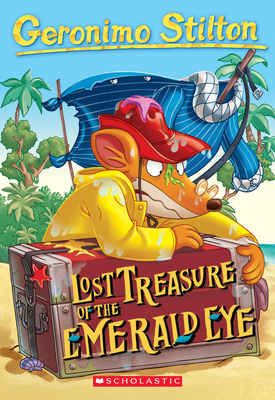 Stilton, Thea, cousin Trap and nephew Benjamin board a ship in search of buried treasure on a secret deserted island. The trip is filled with peril and plenty of humor, though the treasure isn't what anyone expected. The book's lightning pace and its numerous chapters, as well as a full-color design that displays key words in color type and fun fonts, will hook kids in a flash. And those with a taste for Stilton's breezy style will surely want to devour future "whisker-licking-good stories," as the author calls them. The first four book in the Geronimo Stilton series will be released simultaneously, followed by one book per month thereafter. Ages 7-10. (Feb.) Copyright 2004 Reed Business Information.